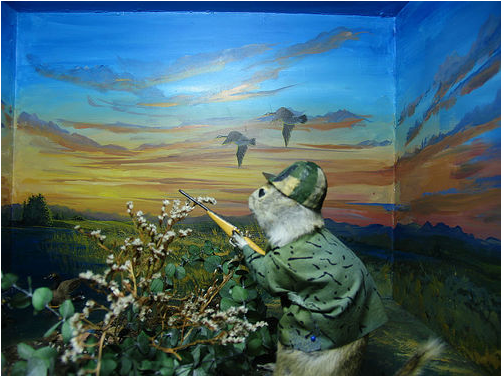 About the size of an RV, Torrington Gopher Hole Museum features stuffed gophers (actually, “Richardson’s Ground Squirrels) posed to resemble the townspeople. Exhibits include gophers dressed as a priest, bank robber, RCMP officer, duck hunter, firefighter, and beautician, among others. Dressed in elaborate costumes and framed by elaborately painted backdrops, the gophers pose in cabinets, their glassy eyes indifferent to the media attention they provoke and the letters pouring in on their behalf. Another nice feature of this museum, is that behind the door where you enter, there is a World Map, where folks are invited to pin where they are from using a sewing pin. North from Calgary, Alberta on the main highway to provincial route 27, then follow route 27 into Torrington. At the corner of 2nd avenue and 1st street. The huge gopher sign will tell you that you're in the right town.